There’s very little that can prepare you for the outrageous journey Gilroy takes his cast on, but the long and short of it is this: Josephina (Zawe Ashton) wants to make a name for herself in the art world, but is stuck under the thumb of legendary art gallery owner Rhodora Haze (Rene Russo). One evening, she comes across her neighbour “Dease” dead in the hallway of her apartment building. When she sneaks into his apartment, she discovers an immense collection of artwork — and with no one to claim it, Josephina claims it for herself. Everyone is excited and riveted by this incredible new artist, but it becomes very clear that there is something deadly hidden beneath the art. I was deliberately vague in that description, not mentioning how bisexual art critic Morf Vanderwalt (Gyllenhaal) factors into the madness, nor the effect of the spectacular supporting cast (featuring Toni Collette, John Malkovich, Blindspotting‘s Daveed Diggs, Tom Sturridge, Billy Magnussen and Stranger Things’ Natalia Dyer), because it is best to go into Velvet Buzzsaw knowing very little and discovering the fresh hell at that awaits the cast at the same time they do. Gilroy has crafted a film that relies on the element of surprise, and packs it full of characters and subplots that are simultaneously compelling and downright ludicrous. 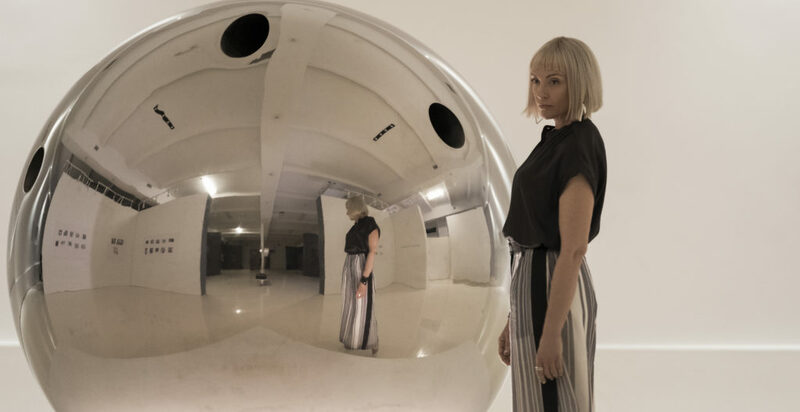 And in total chaotic fashion, Velvet Buzzsaw succeeds almost as often as it falls flat on its face. The dialogue is deliciously hilarious with the satire cranked right up to 11. Some of the dialogue is the very definition of savage. Gilroy is finely tuned to the pompous nature of the art scene, and he makes nearly every character into an over-the-top cartoon to reflect it. It is a wise choice in most instances, but is unbearable in others — which might actually be the point. Russo and Collette are particular highlights here, positively embodying the spirit of their outlandish characters. And while I have never watched Okja (apologies Bong Joon Ho — I promise I’ll watch that and Snowpiercer later this year), I must contend that this is the most campy I’ve ever seen Gyllenhaal. He shows up like a bat out of hell and overshadows every single member of the cast with a brazen and preposterously great performance for the ages. And I am ALL IN the next time he wants to indulge in a character like this. 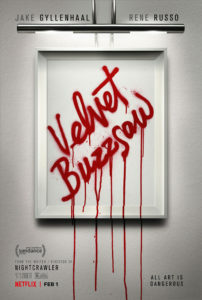 Where Velvet Buzzsaw falters is in its horror elements. The death scenes are all creative and fun (and really show off the increased budget Netflix is starting to put behind its special effects), but they feel disingenuous. I understand that Gilroy is having a blast inflicting pain on these insufferable characters and giving us more than enough reason to cheer for them getting what they deserve. But these brutal death scenes don’t exactly match the satirical tone he’s going for in the scenes that surround them. They feel pasted in after the fact, suggesting he may have pivoted from his initial plans. Do not get me wrong, I do not dislike these scenes at all. But I just feel like they could have been integrated a bit more smoothly (although I will contend that one provides an all too easy joke that becomes all the more effective). But my real question for Gilroy, is why so many cuts to black? Were there no other ways to transition between scenes? As a whole, Velvet Buzzsaw lands closer to Nightcrawler than it does Roman J. Israel. Gilroy could have focused a bit better in some places and brought together the satire and the horror a bit more cohesively. But he still has delivered a wild ride that manages to be a lot of ludicrous fun. I admire Netflix continuing to take chances on filmmakers with such eclectic and deranged visions, and look forward immensely to whatever Gilroy cooks up next. And I know it’s just in the rumour stages right now, but can we start a campaign to get Natalia Dyer cast as Nancy in the new Nightmare on Elm Street reboot? With the way she looks and screams here, she would be a perfect fit.